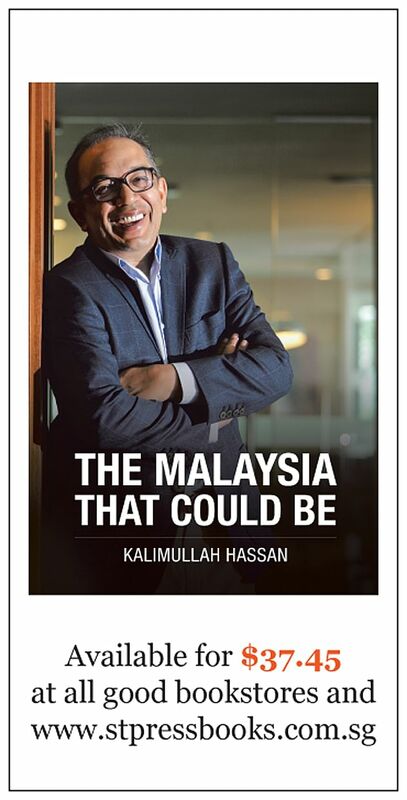 For decades, businessman Kalimullah Hassan has witnessed up close the power play in Kuala Lumpur. He grapples with patronage, corruption and racist rhetoric in a newly published collection of columns and recollections. Below is an edited excerpt from the book's prologue. I first met Tun Abdullah Ahmad Badawi in 1980. He was in his second year as a Member of Parliament and parliamentary secretary; I was a rookie reporter. My first impression was that he was a kind man, a nice guy; and that impression has stayed with me because in the 35 years I have known him, I have very rarely seen him lose his cool. But that does not mean he does not have a temper; he does. In the early years, when Mr Abdullah was going up the ranks in Umno, our relationship was typical of that between journalist and politician - we were wary of each other and yet there was a bond of trust as can be developed only between a journalist and a source. We became friends only when he was sacked from the Cabinet in 1987 by Tun Dr Mahathir Mohamad. His mistake was that he teamed up with Tengku Razaleigh Hamzah and Tun Musa Hitam to take on Dr Mahathir in the fateful Umno party polls of 1987. His team did not make it although he won the vice-presidency. After losing the trappings of power, Mr Abdullah was ensconced in a small office allotted to him by his businesswoman sister-in-law in Jalan Raja Laut, where even his close friends were afraid to be seen visiting him. Many of his colleagues in Umno shunned him; many snubbed him and some even sneered when they ran into him at airports or in public places. That's what endeared him to me - his ability to take all this in his stride, smiling and not lashing out. In the unforgiving world of Malay politics, in particular Umno, he has often been dismissed derisively and unfairly. Unlike many of his peers, or his colleagues, or his predecessor and his successor, Mr Abdullah does not know how to blow his own trumpet. Yet, there were occasions when his firm hand behind the scenes nipped things in the bud before they could deteriorate further - things that even I, as a close friend and confidant, appreciated only after he had left office. If his successor had done even half the things Mr Abdullah did behind the scenes - especially involving race and religious relations - then maybe the 1Malaysia policy would have been successful. Today, the initially well-received idea of 1Malaysia is derided and ridiculed because ethnic and religious tensions have never been so bad since they blew up 41/2 decades ago in the riots of May 13, 1969. Excerpt from the prologue of The Malaysia That Could Be: Shortly after Najib became Prime Minister, Tony Fernandes told me that Wan Shihab Wan Ismail (an aide to PM Najib) insisted that I be removed as AirAsia X chairman. I never verified it with Wan Shihab but from the accounts I heard, I would not be surprised. I was one of the original four investors who had started AirAsia X - together with Tony, his partner, Datuk Kamarudin Meranun, and my partner Lim Kian Onn. I put in my money; even borrowed some initially. This was at a time when the world press and aviation industry scorned the idea, saying a long-haul budget airline had been tried before by Sir Freddie Laker and failed. They all said it would not work. But I believed in Tony and I took the risk. Tony is my friend but he, too, is a businessman first. I started getting messages from other directors and friends, hinting I should resign. So I resigned as chairman a few months later, in February 2010, although the majority of the board had initially rejected my resignation. I, however, did not step down as director until five years later, in June 2015. I remain a shareholder in Air Asia X. Although I was hurt at that time, I could understand why Tony succumbed to the pressure: our investments and the livelihood of those working for us were more important than me holding on to the ceremonial and non-paying post of chairman. Eventually, Najib suggested that former trade minister Rafidah Aziz be appointed chairman. She remains chairman, although, in recent years, she too has been vocal in criticising the Najib regime and, for that, has been subject to attacks from the same rag-tag team of Umno cyber troopers. Subsequently, Tony appointed two close aides of Najib - Datuk Omar Ong Mustapha and Datuk Seri Farid Ridzuan - to the boards of AirAsia (Malaysia) and AirAsia (Thailand). In all the years that Abdullah was Prime Minister, I was not aware of any interference by either Abdullah or his aides in non-government-linked companies - to insist on who should or should not be involved as director or shareholder - although I knew there were many businesses which sought to appoint those who had access to Abdullah to their boards. Just like in the past - during the Mahathir-Anwar-Tun Daim Zainuddin era - and just like the present, in the Najib era. While I personally do not like government interference in the media, I believe that in the context of Malaysia, and in the context of the laws on race and religion that we have, it is necessary to caution those who stray off this path that they are treading a slippery slope. It was on the night of March 8, 2008, when the general election results were trickling in, that I saw the side of Mr Abdullah which had drawn me to be his loyal friend till today. I was standing in the corridor of the 39th floor of the Putra World Trade Centre, where the headquarters of Umno and the ruling Barisan Nasional (BN) are housed, together with then Umno information chief Muhammad Muhammad Taib and Mr Abdullah's political secretary Vincent Lim Kian Tick. The mood was sombre. Mr Abdullah's aides and BN officials huddled in small groups, ticking off the results on newspaper pullouts. It was quite clear by then that the BN was in for a drubbing. Kelantan and Penang had fallen to the opposition and it was neck and neck in states like Perak, Selangor, Negeri Sembilan and Kedah. Ms Azalina said other things which shook us up and which I do not care to repeat because she was probably in a state of shock. People say silly things in that state of mind, we rationalised. But Mr Muhammad would have none of it. He shoved Ms Azalina, none too gently, saying: "Do you know what you are saying? You don't know what you are saying. Go inside." And he ushered her back into the operations room where other officials were gathered, looking at the big-screen television where equally solemn-looking newsreaders rattled off the results as they came in from the vote-counting centres. Mr Muhammad then asked Mr Vincent and me to call Mr Abdullah, saying, "The PM has to know… this is dangerous talk." MrAbdullah arrived minutes later and Mr Muhammad briefed him. His first words, if I remember correctly, were: "Pak Lah, we have lost Selangor… I think you have to calm our people." Mr Abdullah smiled and told us not to worry. "This is all part of the democratic process. Sometimes we win, sometimes we lose." He then proceeded to ask his senior private secretary, Datuk Thajuddeen Abdul Wahab, who subsequently became director of national security, to get the then Inspector-General of Police, Tan Sri Musa Hassan, on the phone. I was just a few feet away from Mr Abdullah and caught snatches of the conversation, which were spoken in hushed tones. In essence, he told Mr Musa that the BN had lost Penang, Kelantan and Selangor, and could also lose Kedah and Perak. (BN did eventually lose in Perak and Kedah.) He told Mr Musa that he wanted to ensure "a smooth handover of power" in the states previously ruled by the BN but was concerned that emotions could run high. Mr Abdullah instructed Mr Musa to ensure that no one was allowed to enter the respective state secretariats and that anyone leaving was to be checked to ensure no files or documents were removed. The police, he said, had to ensure security and oversee the handing over of power. Next, he told Mr Musa to inform the respective chief ministers, outgoing chief ministers, opposition leaders in the states and at national level, to ensure that their supporters did not go out into the streets to celebrate or remonstrate. This, he warned, could be a minefield, especially when politicians and their supporters were emotional. I cannot recall his exact words but Mr Abdullah told Mr Musa to warn both the opposition and his own party leaders that he would not brook nor tolerate any attempt to create trouble and that if anyone did so, they would face the full brunt of the law. In the following days, as BN members and supporters, especially those from Umno, tried to come to terms with what had happened, there were those who sought Mr Abdullah's blessing to "buy over" assemblymen in marginal states like Kedah, Perak and Selangor, or to "cause problems". But he put his foot down and where gentle advice did not work, he warned that he would not hesitate to use the law on anyone - party member, friend or foe - who tried to subvert the democratic process. One chief minister who lost his state came to see Mr Abdullah in his official residence just before he went to be sworn in as prime minister at Istana Negara. The chief minister proposed enticing some Parti Islam SeMalaysia (PAS) assemblymen to cross over and form a coalition with the losing Umno. Mr Abdullah told him in no uncertain terms that he would not endorse any coercion or "buying over" of any assemblyman and advised the former chief minister to accept the results and move on. As the man left the room, some of us who were outside waved to him. He just glared at us and walked away. It was only much later, after he retired, that Mr Abdullah told me what the chief minister had planned to do. Mr Abdullah's behind-the-scenes firmness resulted in the smooth handing over of power in all the five states but it did not endear him to Umno leaders who felt that he had let them down. Umno, as the country has seen, finds it difficult to come to terms with defeat in an election. It was later, in 2009, in his last days as prime minister, that his successor-to-be, Mr Najib Razak, engineered the defections of three assemblymen in Perak, which led to the ousting of the Pakatan Rakyat-led state government. By that time, Mr Abdullah was already a lame duck and could only watch from the sidelines. There were other occasions when Mr Abdullah used his "soft approach" to quell attempts at race and religious bigotry. Once, during the 2006 Umno general assembly, Mr Abdullah's aides and I were gathered in his house to finalise his speech. That morning, then Bernama chairman Anuar Zaini and Mr Abdullah's head of communications Kamal Khalid were upset about an editorial in Utusan Malaysia which was very right-wing. We all agreed that the editorial bordered on being racist and was potentially harmful, especially if Umno members took it as a cue to spew similar comments during debates at the assembly. When Mr Abdullah joined us for breakfast, Datuk Kamal alerted him to the editorial. After reading it, Mr Abdullah's face clouded and his demeanour changed. He was angry and he asked Mr Kamal to call Datuk Khalid Mohd, then the editor-in-chief of Utusan Malaysia. When Mr Khalid came on the line, Mr Abdullah greeted him pleasantly and asked after his family and his wife Rose Ismail, who was also a journalist. After the pleasantries, he told Mr Khalid that he had just finished reading the editorial. Again, I cannot remember his exact words, but he told him that the editorial bordered on the seditious. "Now," he said (if I remember correctly), "You are my friend, Khalid. But if the police decide to investigate you for sedition, I cannot stop them. I have to allow the law to run its course. I cannot tell the police that you are my friend and not to investigate you. And if they think there is a case for you to answer, I am afraid I will not be able to help you." Then he again wished Mr Khalid well and asked him to convey his regards to "Rose and the family". Now, if you are an editor of a Malaysian news publication, and you get a call from the prime minister who is also home minister, and he says that you could go to jail and he won't lift a finger to protect you, what would you do? For the rest of the assembly, Utusan's coverage was muted and there were no more such editorials. If Mr Najib had only done that, perhaps we would not have seen provocative headlines such as the now infamous "Apa Lagi Cina Mahu?" (What More Do The Chinese Want?) in Utusan Malaysia and the many other provocative and race-baiting articles that it has published since Mr Najib became prime minister. Mr Najib, with his theory of the "Chinese tsunami", and Utusan blaming the Chinese for not supporting the BN in the 2013 elections, resulted in the coalition's worst ever performance. • The writer, a former editor-in-chief and deputy chairman of the New Straits Times Press, is chairman of the ECM Libra Financial Group.